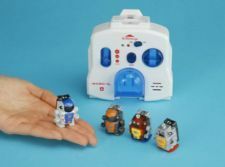 The Japanese Toy manufacturer, Takara Tomy has unveiled the world’s smallest walking robot which named as Robo-Q in Japan. The size of Robo-Q is about 3.4 centimeters high, size of your thumb and with the weight of 12 grams. Although the size of the robot is smaller but it able to walk with two legs and ready for remote controlled. With this features, users can simply remotely controlled the Robo-Q activities such as activate it, stop it and move all directions. The Robo-Q is integrated with IR sensors and a bit programming for automatically navigate and solves small mazes. Currently, it is available in Japan for the price of 3500 yen ($35) and expected to be available in US soon.